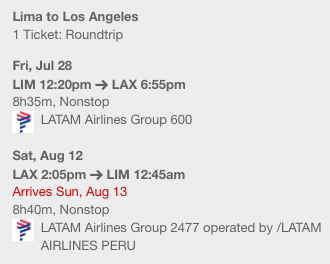 I'm planning a trip to Bangkok, Thailand departing from Lima, Peru and I'm a Peruvian citizen. However, I am making my own itinerary since I found cheaper prices when booking flights separately. 1. Is there a problem to cross the US border through LAX (holding a B1/B2 visa and 2 times, one on my way to BKK and another when going back to LIM) just to take another flight? I mean, I know immigration normally seals your passport with the maximum time that you are allowed to stay but, since I will enter the country and then leave it in some hours, I don't know if this will be a problem or not, when re-entering the country, or if I'm ignoring something (like a rule) that maybe I should know. 2. If there's no problem with the first question then I would like to know if the times between each flight that I am planning to book are enough. So, I know the times to go through immigration/customs/taking your bags vary from airport to airport but maybe someone knows better about LAX. Apart from that, on each flight I am considering the 3h needed before each international departure and some time for immigration/customs/taking my bags and a possible delay. However, I am specially doubting if the time before taking the flight from LAX to LIM is enough. 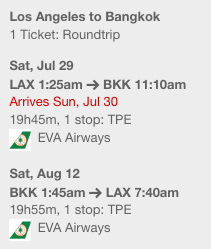 Is there a problem to cross the US border through LAX (holding a B1/B2 visa and 2 times, one on my way to BKK and another when going back to LIM) just to take another flight? If there's no problem with the first question then I would like to know if the times between each flight that I am planning to book are enough. More than enough time, even factoring in a couple hours of delay and crossing security and changing terminals. You have minimum 6+ hours. The link provides a walk-through changing terminals in LAX. Not the answer you're looking for? Browse other questions tagged usa customs-and-immigration tickets lax bkk or ask your own question. Is it a problem to go through immigration 3 times in 2 weeks, for really short periods?